After Acer’s launch of the world’s thinnest laptop, Lenovo occupied the stage at IFA 2016 to unveil a host of goodies. It refreshed its Yoga series by announcing a range of new products in the laptop and tablet segments. The most notable announcements include the unique Yoga Book with the first-of-its-kind Halo keyboard and real-en accessory, the Yoga 910 2-in-1 with a fingerprint sensor, and the Lenovo Yoga Tab 3 Plus that comes with a splash proof display. The 2-in-1 Lenovo Yoga Book is possibly the most interesting device launched in the keynote. The Yoga Book is a convertible with a unique Halo Keyboard and a real-pen accessory. The Halo Keyboard is a full touchscreen backlit ‘slate-like’ keyboard which lacks any physical keys. It is a capacitive keyboard with inbuilt artificial intelligence software which learn the user’s typing and navigation habits, and also brings predictive typing. Then there’s the real-pen accessory which draws on the halo keyboard just like a real pen. The biggest highlight of this pen is that it never needs charging, doesn’t require batteries, and has an ink tip that can be replaced with standard ink tips, just like that of a conventional pen. Lenovo touts the Yoga Book as be the thinnest and lightest 2-in-1 laptop hybrid in the world, clocking in at just 9.6mm and 690 grams. As for the specifications, the Lenovo Yoga Book (Android) runs on Android 6.0 Marshmallow-based Book UI, and there’s also a Lenovo Yoga Book (Windows) variant running on Windows 10. 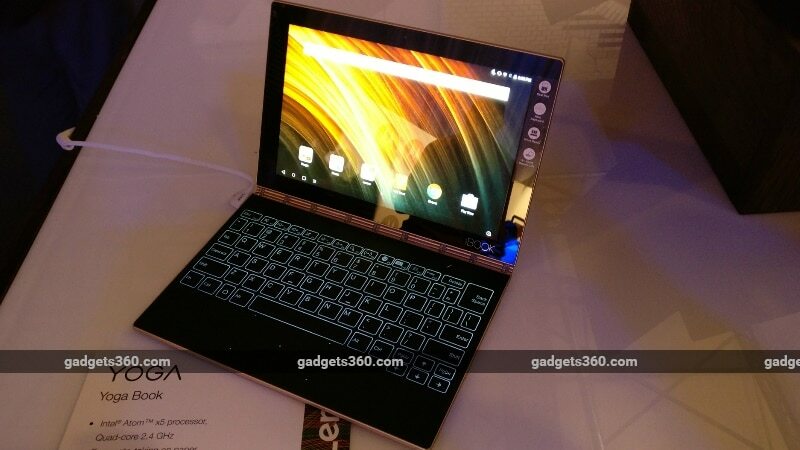 It features a 10.1-inch IPS FHD screen, and is powered by the Intel Atom X5 processor and 4GB of RAM. It offers 64GB of inbuilt storage, and the company claims that the battery can last up to 12 hours of use on a single charge. It will be available in a choice of Gunmetal Grey and Champagne Gold. The Lenovo Yoga Book is priced at EUR 499 (roughly Rs. 37,300) for the Android version, and EUR 599 (roughly Rs. 44,700) for the Windows version. Lenovo will start selling it sometime in the beginning of September, and the 2-in-1 will be released in the US market by the end of October. The company released another convertible in the Yoga series called the Yoga 910. The Lenovo Yoga 910 convertible laptop sports a full metal design, a 360 degree rotating hinge, and comes with an integrated fingerprint sensor on the keyboard for faster login. It will be made available in Champagne Gold, Platinum Silver and Gunmetal colour variants. It features a 13.6-inch 4K near edgeless display (5mm bezel), and is powered by the latest 7th generation Intel Core i7 processor. The company claims that the laptop can last up to 15.5 hours on a single charge. It houses JBL speakers with Dolby Audio Premium for enhanced sound quality. The Yoga 910 is priced starting at EUR 1,499 (roughly Rs. 111,900) including VAT, and will be available starting October. Lastly, the Lenovo Yoga Tab 3 Plus was also added to the Yoga series. It features a 10.1-inch inch WQXGA (2560×1600 pixels) IPS splash proof display with 299ppi. It is powered by a Snapdragon 652 octa-core processor with Adreno 510 GPU and 3GB of RAM. It offers 32GB inbuilt storage, with the option to expand further via the microSD (up to 128GB). It runs on Android 6.0 Marshmallow, and supports a single SIM card. Optics include a 13-megapixel autofocus rear camera, and a 5-megapixel front focus selfie camera. The Lenovo Yoga Tab 3 has four front-facing JBL speakers with Dolby Atmos tech. It packs a 9300mAh battery that claims to last up to 18 hours of usage. It also supports fast charging. Connectivity options include 4G LTE, WiFi, Bluetooth 4.0, GPS, GLONASS, and USB Type-C post. The tablet measures 247x179x4.68mm, and weighs around 637 grams. The Lenovo Yoga Tab 3 Plus will be made available in November in Puma Black Finish and Gunmetal Grey colour variants. The price of the tablet starts at EUR 299 (roughly Rs. 22,330). Outside of the Yoga series, Lenovo has launched another 2-in-1 laptop called the Miix 510. The laptop runs on Windows 10, and has a detachable backlit keyboard. The keyboard can be removed altogether or be adjusted to a slant pose for more ease in typing. There’s an additional stand attached at the back for resting the touchscreen even without the keyboard. The screen supports the Lenovo Active Pen stylus, features a 5-megapixel rear camera with autofocus, and a 2-megapixel selfie camera. It dons a 12.2-inch FHD (1920×1200 pixels) 320 nits screen with Gorilla Glass protection. The Lenovo Miix 510 is powered up to sixth generation Intel Core i7 processor paired with up to 8GB of LPDDR4 RAM and 1TB SSD. Connectivity options include 4G LTE, Wi-Fi, Bluetooth 4.0, two USB Type-C ports. The dimensions measure at 300x205x15.9mm, and the 2-in-1 weighs 880 grams. Lenovo claims that the Miix 510 can last up to 7 hours on a single charge. The Lenovo Miix 510 is priced starting at EUR 699 (roughly Rs. 52,200), and will be available from the beginning of October.